With the cool wet spring we have had so far in 2011, planting corn in northeast Wisconsin has been delayed. In general, if all corn In Wisconsin could be planted on one day, that optimum date would be May 1 in the south and May 7 in the north. Once corn planting is delayed beyond these optimum dates then grain yield decreases AND grain moisture increases in most years. 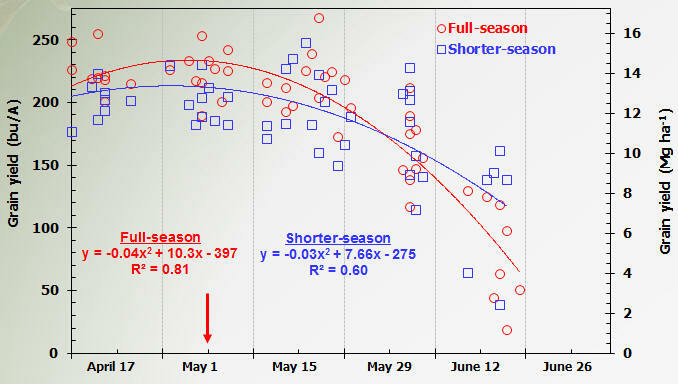 By May 15 corn yield is decreasing 0.5 bu/A per day delay accelerating to 2.5 bu/A per day delay on June 1 (Figure 1). Figure 1. The planting date producing maximum corn grain yield is May 1. 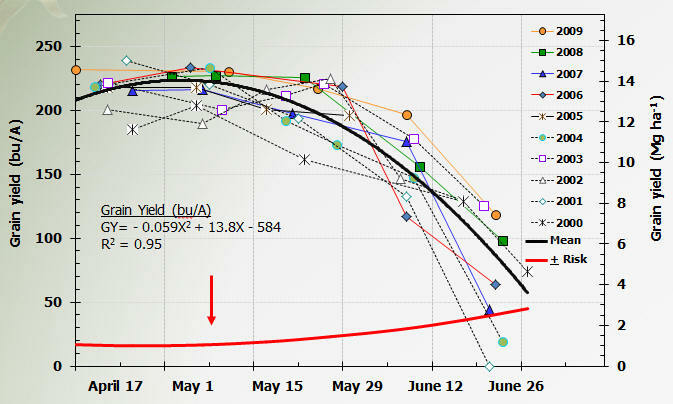 Grain yield decreases 0.5 bu/A per day on May 15 and accelerates to 2.5 bu/A per day on June 1. Source: Lauer (Full-season hybrid at Arlington, WI). For corn to develop and progress from planting to emergence normally takes about 125 Growing Degree units (GDUs). During the first week in May, southern Wisconsin normally accumulates about 10 GDUs per day, so emergence takes about 12.5 days. This year in an experiment conducted at the UW Agricultural Research Station – Arlington the earliest planting date treatment was April 13. This treatment experienced snow and minimum air temperatures in the low 20s F. As of May 12, none of the three hybrids planted in this experiment had begun to emerge yet. So there really has not been enough GDUs for much emergence to take place yet for much of the early planting season. The recent warm weather should help with plant emergence. There is an yield and moisture trade-off between full- and shorter-season relative maturity (RM) hybrids. In southern Wisconsin the yield trade-off is 1.9 bushels per RM unit. For example, a 100 d ay RM would typically yield 19 bu/A more than a 90 day RM hybrid. The highest yielding hybrids are those that utilize entire growing season and are typically full-season for maturity. Eventually full-season hybrids run out of growing season and are impacted more for grain yield than shorter-season hybrids (Figure 2). Relative maturity must be balanced against harvest grain moisture and the ensuing drying costs required to dry grain down to 15.5% moisture. Full-season hybrids are often wetter than shorter-season hybrids at grain harvest. Figure 2. Shorter-season hybrids (7 to 10 days RM) become more economical (yield and moisture) than full-season hybrids after about May 23. Source: Lauer (Arlington, WI, 2002-2010). This year, especially in northeast Wisconsin, many farmers are concerned about the need to switch hybrids from full- to shorter-season relative maturity. Switch date is influenced by corn price and fuel price for drying costs. As corn price increases, the switch date of hybrids from full- to shorter-season occurs later. As drying cost increases, the switch date of hybrids from full- to shorter-season relative maturity occurs earlier. Typically the switch date for corn ranges between May 20-25. When farmers switch to new hybrids they should shorten relative maturity of hybrids to be planted by 7-10 days. The switch date decision is also influenced by the eventual use of the corn (Table 1). If the field to be planted is intended for corn silage or high moisture grain, then switch dates can be later because there is less concern about drying costs. The crop needs to achieve between 25% kernel milk for silage and black layer for high moisture corn grain yield to optimize yield. and relative maturity zones in Wisconsin. Another factor influencing switch date is, what shorter-season hybrids do you switch to? During the winter, a lot of research often goes into selecting good high performing full-season hybrids. But as the decision to switch to shorter-season hybrids draws near, do you have enough time to adequately research and find a good performing shorter-season hybrid? Is a good high-performing hybrid available from the seed company? Remember the basics (see http://corn.agronomy.wisc.edu/AA/A082.aspx) as you select new hybrids and don’t be pressured into switching into just any hybrid – make sure it is a good performer. In addition, switch dates are influenced by geographical location. There is more flexibility for southern Wisconsin than northern Wisconsin. In southern Wisconsin, we have two or more possible switch dates for grain, May 20-25 and June 1-5 (Table 1). While in northern Wisconsin, we have only one switch date May 20-25. If corn planting is delayed until June 1 in northern Wisconsin and June 15 in southern Wisconsin, then growers should consider putting corn planters away and planting soybean. The low corn yields seen in June will not recover the input costs required to produce the crop. This decision is influenced by corn price, price of the alternative crop (usually soybean) and the proportion of farm acres of each crop left to be planted. If the production objective is dry grain and you have been delayed, then you may want to begin pricing fuel for fall drying. Corn planters could be brought back out after July 1. By this time, if fields are not planted, the production objective becomes “emergency forage” for dry matter production. We have produced up to 6.8 T/A dry matter with July planting dates for corn (see http://corn.agronomy.wisc.edu/Research/03DOP/Late2005.pdf and http://corn.agronomy.wisc.edu/Research/03DOP/Late2006.pdf). We are not to this point yet. One last point is that late-planted corn often has increased pest pressure, especially from European corn borer (ECB). Planting a transgenic Bt-CB hybrid can help manage ECB if pressure is high. See Corn Replanting or Late-Planting Decisions (UWEX Bulletin A3353) for guidelines on switch dates for corn hybrid maturity.